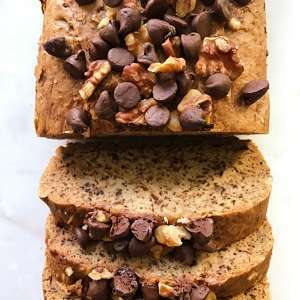 An easy family recipe that yields a perfect banana bread no matter what your dietary preferences-- Gluten-Free, Dairy-Free, Vegan, Nut-Free-- you choose! Chocolate Chip and Walnut topping optional. Light, moist, soft and fluffy! Winter weather always puts us in the mood for baking — something about the oven on and warm, sweet smells in the kitchen that are so cozy! And nothing is better than a classic banana bread! Besides at the end of the week, we always seem to have some ripe bananas in the house so freshly baked bread is the perfect use for them. This recipe is from my mom and it is one of those super simple recipes that adapts so well to dietary needs and preferences. The original recipe was obviously not gluten-free, so with this gluten-free version we used GF Jules All-Purpose Gluten Free Flour. (Affiliate link), which has been our go to gluten-free flour for years as it is easy to substitute 1 for 1 in non-gf recipes. And we added some baking powder and reduced the baking soda so that the loaf was still light and fluffy. We’ve also made with dairy-free butter and flax egg making it vegan. And you can omit the walnuts if you have a nut allergy. 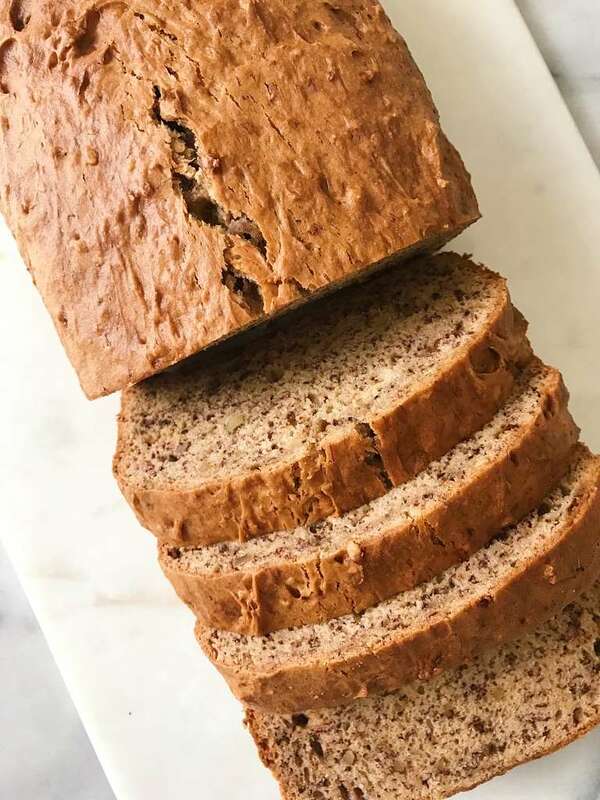 No matter how you make it, this bread has a perfect texture — moist (not dry or crumbly), velvety smooth and light and fluffy, just the right amount of sweetness and is always a hit! 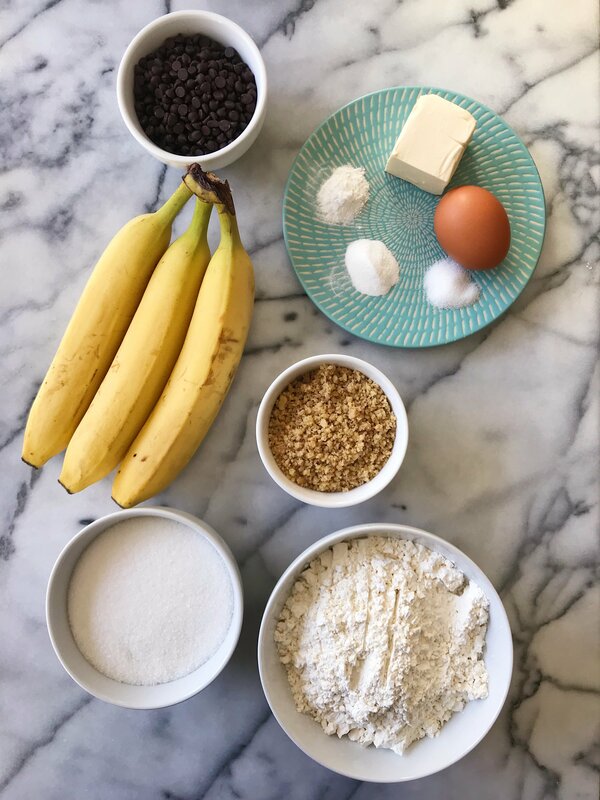 All you need… 8-10 ingredients all found in your pantry: gluten-free flour, baking soda, baking powder, salt, egg or flax egg, bananas, butter, sugar and chips and or walnuts according to tastes. The only debate we have in our house is whether or not it should have chocolate chip and walnuts on top? My husband and kids are purists and love just a good ol’ classic banana bread. I tend to like chips and extra walnuts on top. Which would you choose? 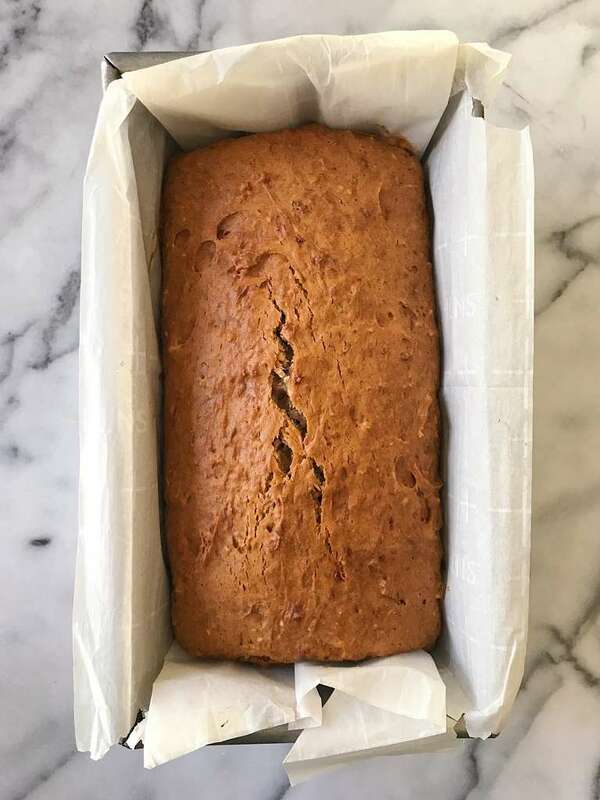 One final tip: when making a loaf bread with toppings I like to line the loaf pan with parchment paper rather than grease and flour the pan. First, it is so much easier to lift the parchment and the baked bread right out of the loaf pan and not worry about losing any toppings. And second it is so much easier to clean, which is a huge win! Scroll down to see recipe and leave a comment if you try it. 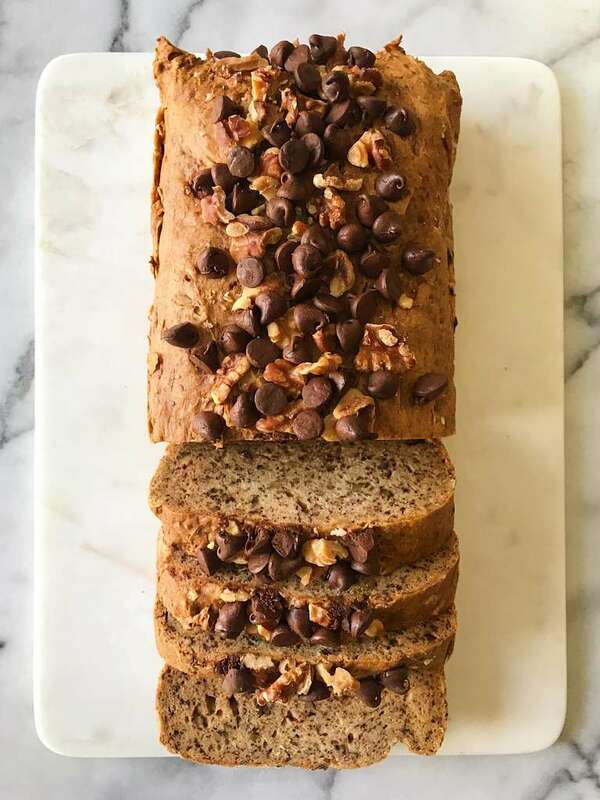 An easy family recipe that yields a perfect banana bread no matter your dietary preference or need --- Gluten-free, Dairy-Free, Vegan, Nut -Free-- you choose! Chocolate Chip and Walnut Topping optional. Mix 1 tablespoon flaxseed meal with 2.5 tablespoon water in a small bowl and stir to combine. Let rest for 5 minutes to thicken. And line a 10 in loaf pan with parchment paper OR grease and flour. I recently started using parchment paper because it is easier to lift out the bread if topping with chips and/or walnuts and easier to clean. In a small bowl combine flour, baking soda and salt and combine with a pastry cutter or fork. Set aside. In a large mixing bowl, add egg or flax egg, sugar, butter and bananas and mix to combine and smooth. Add dry ingredients and wet ingredients and mix to combine. Stir in chips and nuts if using. Using a large spoon scoop or pour batter into prepared bread pan and spread evenly. Top with additional chocolate chips and walnuts if desired. Bake for 45 - 50 minutes, or until wooden pick inserted into center comes out clean. Tip: check at 35 - 40 minutes and if top is starting to brown, cover loosely with foil and continue baking until center done. Absolutely loved this recipe! I made mine in muffin tins and reduced time to 35 minutes in the oven. Complete perfection – brown on top and moist inside. Such a fluffy recipe, my non-gf friends said you’d never know it was gluten free! Aw, this makes me so happy! So happy everyone — especially your non gf friends!– loved them! Thanks for sharing! Thank you so much! So happy you love it as much as we do! It doesn’t last long here either — thank goodness it is easy to whip another one up!